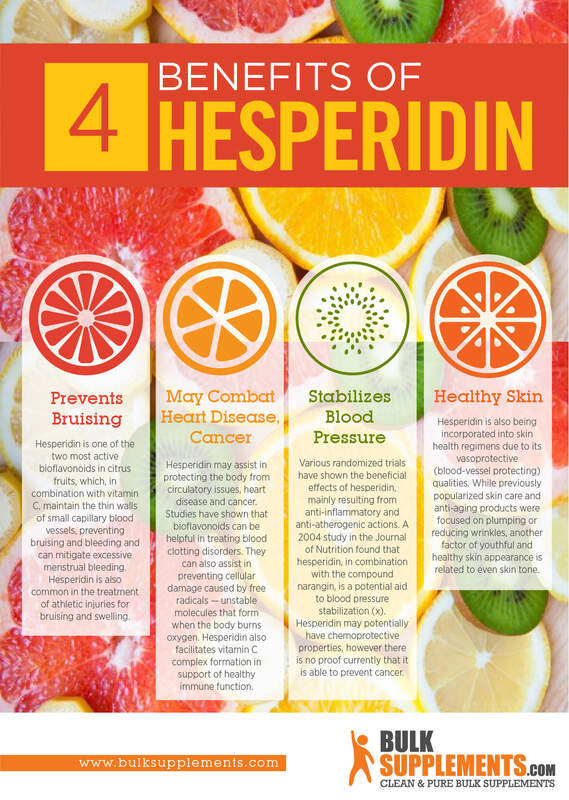 Hesperidin is a naturally occurring bioflavonoid mainly present in lemons and oranges, but also found in other fruits and vegetables. 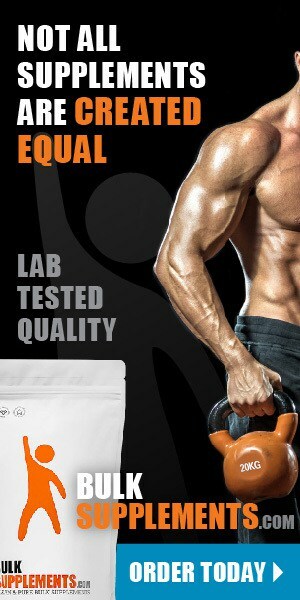 The body does not produce hesperidin on its own, so it is only accessible through foods or dietary supplementation. Bioflavonoids are antioxidants, and also provide the color, flavor and scent to plants. Hesperidin and similar bioflavonoids are commonly known as vitamin P, though they are not actually vitamins. Utilized for centuries in traditional Chinese medicine (x) (x), hesperidin was first isolated in 1828 by French chemist Lebreton from the white inner layer of citrus peels (x). The name is derived from the word hesperidium, meaning fruit produced by citrus trees (x). Hesperidin is the main flavonoid in sweet orange and is both colorless and tasteless. It is not soluble in neutral solutions, but is slightly soluble in acidic solutions such as citrus juice. Hesperidin demonstrates various pharmacological benefits and actions including lowering hypertension and fats, as well as diabetic regulation due to its antioxidant properties (x). Hesperidin is a part of a larger category of compounds called polyphenols. Polyphenols in plants vary greatly and, in many cases, plants contain various different polyphenols. The broad category contains hesperidins in addition to procyanidins, catechins and quercetins in apples, tea, and citrus (x). Traditional herbalists have utilized the peels of citrus fruits for thousands of years in the treatment of various diseases and disorders. In Asia, orange zest, lemon zest and dried orange peel are common ingredients in cooking for medicinal healing and treatment of digestive disorders. Traditional Chinese medicine doctors utilize mature mandarin orange peel, known as Chen Pi or Ju Pi, to improve digestion, relieve gas and bloating and resolve phlegm. In traditional medicine, the peel acts primarily on the digestive and respiratory systems. It can alleviate fullness and distention and treats loss of appetite, vomiting and diarrhea. Immature mandarin orange peel — or Qinq Pi — may act on the liver and stomach to promote digestion and relieve food stagnation. Qing Pi is also a common treatment for bloating located on the right side or directly under the rib cage (x). Hesperidin is one of the two most active bioflavonoids in citrus fruits, which, in combination with vitamin C, maintain the thin walls of small capillary blood vessels, preventing bruising and bleeding, and can mitigate excessive menstrual bleeding. Hesperidin is also common in the treatment of athletic injuries for bruising and swelling (x). Hesperidin may assist in protecting the body from circulatory issues, heart disease and cancer. Studies have shown that bioflavonoids can be helpful in treating blood clotting disorders. They can also assist in preventing cellular damage caused by free radicals — unstable molecules that form when the body burns oxygen (x). 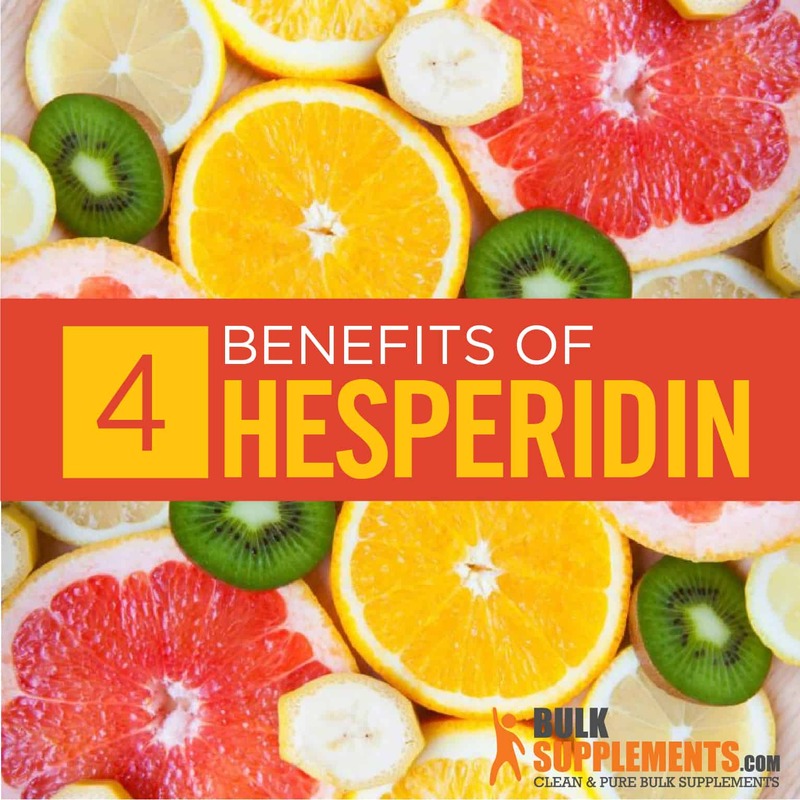 Hesperidin also facilitates vitamin C complex formation in support of healthy immune function (x). Various randomized trials have shown the beneficial effects of hesperidin, mainly resulting from anti-inflammatory and anti-atherogenic actions. A 2004 study in the Journal of Nutrition found that hesperidin, in combination with the compound narangin, is a potential aid to blood pressure stabilization (x). Hesperidin is also being incorporated into skin health regimens due to its vasoprotective (blood-vessel protecting) qualities. While previously popularized skin care and anti-aging products were focused on plumping or reducing wrinkles, another factor of youthful and healthy skin appearance is related to even skin tone (x) (x). Bioflavonoids (hesperidin specifically) can provide a lightening effect of skin tone and brighten sallow and age-damaged skin (x) (x). Hesperidin is capable of reducing the appearance of age spots by diminishing the potency of active tyrosinase (the enzyme responsible for producing melanin). As the precursor to melanin, inhibiting tyrosine evens skin tone and discoloration. Bioflavonoid rutin works in conjugation with hesperidin to combat spider veins and varicose veins by maintaining and regulating blood circulation (x). Bioflavonoids are a group of approximately 4,000 plant metabolites that are naturally occurring and largely responsible for the vibrant coloring of many fruits, vegetables and flowers. The main health benefit of bioflavonoids in general is to neutralize reactive oxygen species by the donation of one electron, thereby stabilizing the molecule and breaking the oxidative chain. Three of the most well-researched bioflavonoids are hesperidin, quercitin and rutin. These bioflavonoids have been studied in the prevention and reduction of wrinkles, age spot appearance and vein health including spider and varicose veins. Quercitin significantly protects from depletion of antioxidants due to skin exposure to UVA rays. Quercitin also assists in the rejuvenation of skin elasticity and reduces the appearance of wrinkles. Rutin assists in the mitigation of spider veins by maintaining healthy blood circulation. It also lowers the permeability of capillaries and thins the blood, leading to increased micro-circulation so the cells can receive more oxygen and nutrients (x). These plant metabolites are potent on their own. Synergistically, though, they can offer an even greater harmonizing effect when used together (x). These three bioflavonoids can rejuvenate the skin to combat aging, repair damage due to pollution and fight premature wrinkles and discoloration. By nourishing and protecting the skin’s ability to reproduce and heal, bioflavonoids help to maintain a more youthful appearance without negative side effects (x). Hesperidin is extracted from citrus juice to form crystals that appear as white flakes upon evaporation and concentration of juice. It treats triturated peel with alkaline compounds to dissolve the flavonoids, which are then separated from the solid residue and precipitated by acidification (x). Polyphenols are safe and nontoxic. They have a long history of consumption in various fruits and vegetables over a long period of time (x). Hesperidin is similar in structure to hydroquinone. However, hesperidin is becoming increasingly popular because it has fewer (if any) side effects in comparison to hydroquinone. Research has determined that hesperidin safely produces a reduction in activity of tyrosinase. In other words, it safely reduces the appearance of age spots (x). As a dietary supplement, take 500 mg (just over 1/4 tsp) one to two times daily with food and water, or as directed by a physician. Do not take this product if you are pregnant or nursing. Be sure to talk to your doctor before taking hesperidin if you are diabetic or have chronic low blood pressure. Avoid taking two weeks before a scheduled surgery. Hesperidin is a compound necessary for skin health and damage prevention from aging. It is a naturally-occurring compound in various fruits and vegetables, primarily in the peels of citrus fruits. As part of the bioflavonoid group, hesperidin works in harmony with quercitin and rutin to promote skin health and vitality. In combination with vitamin C, hesperidin (or vitamin P) assists in maintaining healthy capillaries and small blood vessel walls. Supplementing with hesperidin can reduce the prevalence and intensity of spider veins and varicosities and can improve overall vein health. Hesperidin has antioxidant properties and influences cytokine levels. It can also lower high blood pressure and even treat diabetes. All in all, this is a marvelous supplement for skin health. It is easy to incorporate into the diet and, better yet, is present in some delicious foods!